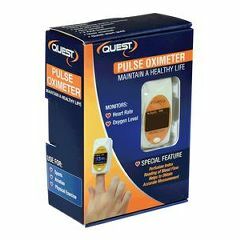 AllegroMedical.com presents The Pulse Oximeter offered from Quest Products Inc. Quest 3 in 1 Pulse Oximeter is a reliable way to spot-check blood oxygen saturation and pulse rate. This lightweight portable device takes fast, non-invasive measurements at the fingertip. Ideal for sports, aviation and personal use. Not intended for continuous monitoring.